Believe it or not, the base of this recipe maybe considered a classic. I’m still in the process of growing my classic cookbook collection and I found this Sweet Potato Roll recipe in my newly purchased “Beard on Bread” cookbook (more recipes to follow! ), by great American foodie and Paula Peck mentor, James beard. I of course made a few adjustments. I added raisins that had been soaked in apple cider (to maintain their plumpness after the rolls are baked). 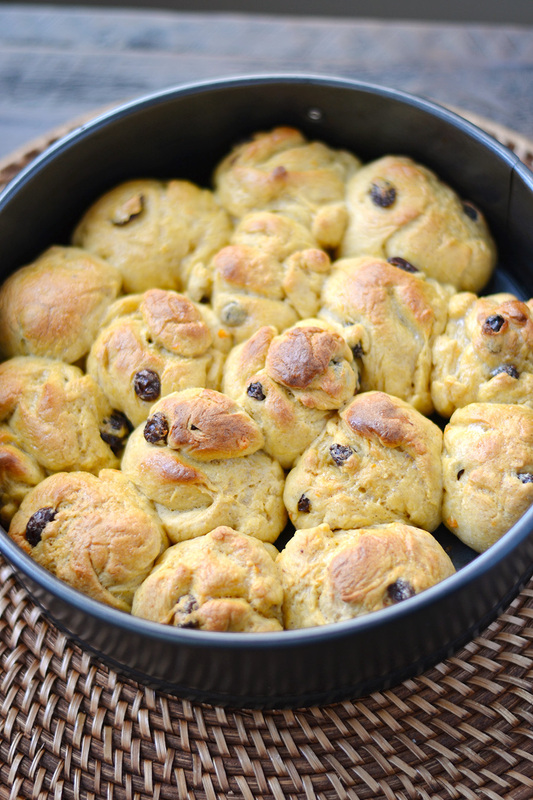 The raisins can be eliminated for more savory rolls. I love the combination of raisins and bread so this was a natural addition I couldn’t resist. This bread roll recipe requires yeast, so it does require time and patience. If you’re not accustomed working with yeast, don’t be scared. Once you understand the basics, it’s fairly easy and the same concepts can be applied to all different types of bread. There are two tips I find helpful: 1. a warm liquid and a sugar or sweetness to initially activate the yeast 2. kneading the dough until it’s soft and springy. 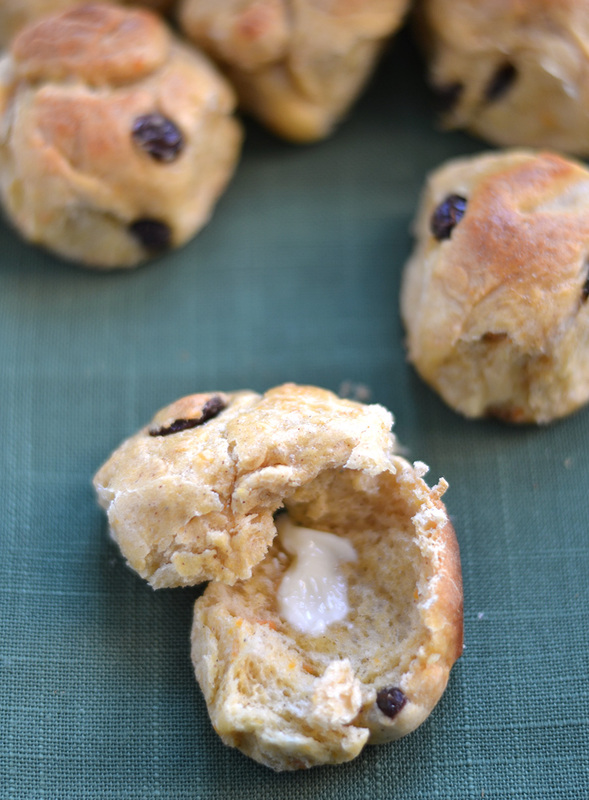 I won’t say this will make your bread rolls foolproof but it will definitely help. Warm sweet potato rolls slathered with butter are worth it. The sweetness and texture of the mashed sweet potatoes create soft flavorful rolls that are the perfect addition to your Thanksgiving meal (or Thanksgiving leftovers). Place raisins in a small bowl and add apple cider. Set aside. Combine yeast with one tablespoon of the sugar and the warm water in a mixing bowl and let proof for 5 minutes. Add the remaining sugar, butter, salt, and 2 of the eggs to the yeast mixture, and stir to blend well. Stir in the flour, 1 cup at a time, then stir in the mashed sweet potatoes. Turn out on a lightly floured board and knead for 2-3 minutes, adding only enough flour to prevent the dough from sticking to the board. When the dough is smooth and springy to the touch, shape it into the ball. Put in a buttered bowl and turn to coat the surface with butter. Cover with plastic wrap and let rise in a warm, draft-free spot until doubled in bulk, about 1 hour. Punch down dough, then shape it into a ball and let rest for 2 minutes. Pull of equal pieces about the size of golf balls and shape into balls, about 2 dozen of them. Place them on a buttered cookie sheet, about 2 inches apart or in if you want rolls joined, about ¼ inch apart in a 9-inch cake pan or spring form pan. Cover and let rise until doubled in bulk. Preheat oven to 375 degrees. Beat the remaining egg with the honey and brush this mixture onto the rolls. Bake in preheated oven for about 20 minutes, or until rolls sound hollow when tapped on bottom and are a lovely brown color.